Okay, so OBVIOUSLY groundhog Phil tricked us into believing that spring would come early - as there is 4 inches of snow outside my window right now. It was awfully cruel of him to bring our hopes up like that, but nevertheless that deceitful woodchuck won’t deter my plans to ring in spring with the season’s hottest colors. Tomorrow marks the official start of Spring, so if you haven’t done so by now – it’s time to start switching those drab winter clothes for bright bold numbers we’ll wear well into the season. 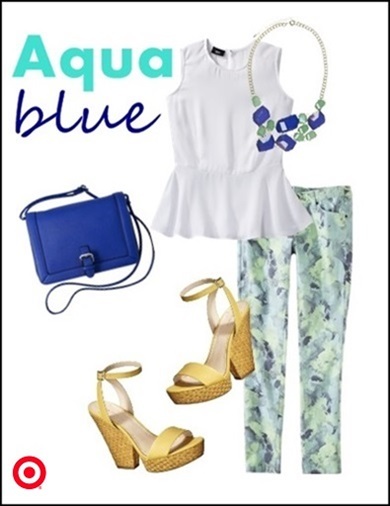 Coral, Aqua, and Yellow are making a big splash in fashion. These sherbet colors look delectably delicious on everything from shoes, jewelry, to dresses and jackets. Using some Target pieces, I styled a few outfits with these key colors to show how they can lighten up your spring in all the right ways! Tell me which one is your fave. For the first look, I paired the Mossimo colored denim skinnies with a sleeve-less peplum top, and for the accessories I added the Xhilaration tammy plank wedge sandal, Merona Saffiano crossbody, and the swag necklace with gemstones. The second look has the yellow Mossimo Women’s v-neck cap sleeve dress, paired with the Xhilaration primrose open-toed pumps, and the Prabal Gurung multicolor clutch, & gold leaf drop earrings for the extra touch of pizzazz. The third and final look is a casual outfit consisting of the Merona chino shorts, Prabal Gurung racerback tank, Merona crossbody bag, and the Lina espadrilles in yellow for a punch of color.